Pissarro was, like Claude Monet (1840-1926), Alfred Sisley (1839-99) and to a lesser extent Renoir (1841-1919), a devoted adherent of plein air painting, especially country landscapes with an everyday humble theme. Where Monet and Sisley's landscape painting tended to focus on the nature being explored by townsfolk, Pissarro tended to paint more timeless forms of nature - fields, orchards, farmhouses and so on. When his eye problems arose late in life, Pissarro painted scenes from his window. See for example his wonderful series of urban landscapes - the Boulevard Montmartre paintings (1897-8). It was at Pontoise in 1872 that Pissarro initiated Cezanne (1839-1906) into the mysteries of painting in bright colours, a veritable conversion on the part of the painter from Aix-en-Provence, committed as he was to his dark hues. Cezanne, who esteemed Pissarro very highly, said that of all the painters "he was in the closest touch with nature." Later, he recalled Pissarro in these moving words: "He was both humble and very great, in some ways rather like God." A testimony to Pissarro's status as one of the best landscape artists of his day. The two artists, whose influence over each other was henceforth mutual, often painted the same scenes. This picture was painted at Pontoise itself, at the back of the small house on the Quai du Pothuis where Pissarro lived. The orchard is dominated by the slope of the Hermitage, a massive, well-constructed landscape, very suitable to the temperament of the two artists as they sat side by side painting it. (Cezanne's version never got beyond the stage of a sketch.) 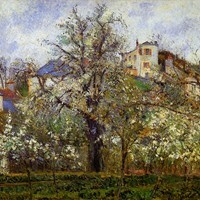 Pissarro, with characteristic perseverance, wished to perfect this delicate landscape with its flowers, before rain or a violent wind came and destroyed the scene, while Cezanne, before a landscape like this, considered the graceful decoration of the flowers and blossoms as subsidiary to the shape and moulding of the trunks and branches of the trees, which interested him more. The time of year, therefore, made little difference to him. Pissarro, painting a nature rejoicing in spring colours beneath a blue sky, was particularly sensitive to the beauty of these spring-time orchards, which Monet and Sisley also painted, but less lyrically. This subject had been exploited in several pictures before Pissarro by Charles Daubigny (1817-78), a key figure in the Barbzon School of landscape painting and a great admirer of the Normandy apple orchards. Two years later, Vincent Van Gogh (1853-90) at Arles achieved some magnificent pink and white fantasies on the same theme. Speaking of this picture, the great art critic Lionello Venturi (1885-1961) said: "I know of no other picture which conveys to the same extent the joy, the freshness, the pleasure of rebirth, inherent in the spring." Vegetable Garden with Trees in Blossom was bought by Gustave Caillebotte (1848-94) who bequeathed in to the Louvre in 1894. It was exhibited first at the Palais de Luxembourg (1896-1929), then in the Louvre (1929-86), after which it was transferred to its present home at the Musee d'Orsay. NOTE: For the full story behind French Impressionism and its differing styles, as well as the artists involved, see our 10-part series, beginning with: Impressionism: Origins, Influences.